As a professional gardener, I try to walk as carefully on this glorious blue sphere as possible, but sometimes, even the best intentions are proven to be misguided. My friend Sam Bahr asked me to share an painful lesson I learned this past growing season, something that I gladly share so that others do not make the same mistake. Here is the story I wrote for Smithsonian Gardens Blog. Back in September I wrote a blog post for Smithsonian Gardens about how excited I was by the bounty of monarch Butterflies inhabiting the Mary Livingston Ripley Garden. It was so enchanting to see the quantity of Monarchs in all stages of life – there were adults flitting from flower to flower; there were lots of caterpillars happily munching away on Asclepias curassavica, a tropical milkweed that I had allowed to self-sow abundantly in the garden; and for those keen eyed enough, there were glorious jade colored Chrysalis in abundance. It was AMAZING!! But as September changed to October, I started to get a bit nervous about those wee caterpillars and remaining chrysalis. I started checking daily to see if they were pupating and getting out of Dodge. If you remember, Monarchs do not survive here in the DC metro region during the winter. They must migrate south to Mexico. There are populations that remain at the southern tip of Florida, and warm parts of Southern California, however the populations here on the East coast start gathering in September and make the arduous journey together. But my Monarchs seemed to have no clue that they should be doing anything of the sort. They were enjoying the unseasonably warm days, and feasting on the abundance of nectar and new growth on the tropical Milkweed. I was starting to seriously worry. And my concerns were unfortunately confirmed. Alfonso Alonso, a Monarch specialist with the National Zoo, came for a visit and shared quite a bit of information with me which made me realize how much damage a single well- meaning gardener can do. First off, Alfonso confirmed that yes, my Monarchs were not even thinking of packing for the trip south. Rather than packing up to leave, they were settling in – Alfonso pointed out numerous small caterpillars in NOVEMBER… these guys have no chance of making the migration. Why would they? They had a gravy train of their favorite food—apparently the tropical milkweed, Asclepias curassavica I was growing is irresistible to them, something like chocolate for me. They were not leaving as long as it was still there and flourishing. So I immediately started yanking the tropical milkweeds – and much to my surprise an adult was following me with my cart full of yanked blooming plants. 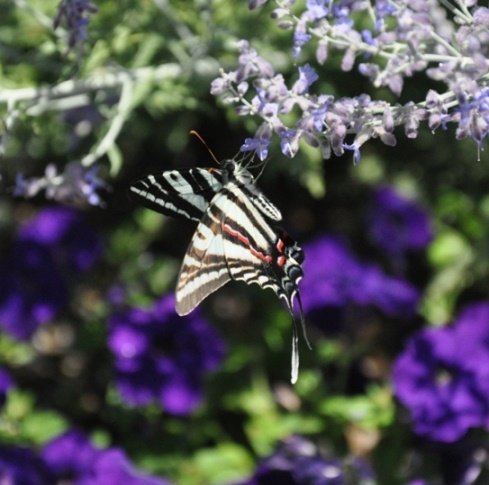 I assumed she just wanted a final sip of glorious nectar – but no – SHE WAS LAYING EGGS! IN NOVEMBER!! Yikes! I really had confused her by growing the tropical milkweed. Alfonso suggested that if I wanted to still grow the tropical milkweeds, I need to cut them back early in September to give the butterflies a reminder that it was time to pack. Sounds easy, but since they would be in full glorious bloom, it would be really hard to do. Perhaps I could bring myself to do that, but would all of my visitors have the same toughness? Would they remember when to yank it? Probably not. As a public gardener, Asclepias curassavica has moved to my DO NOT GROW list. That part of the lesson from Alfonso wasn’t so bad, but he wasn’t done yet. Next he shared with me information about Ophryocystis elektroscirrha or OE. This is a single celled organism that is an insidious parasite for the Monarchs. OE was first described over 20 years ago and is thought to have evolved along with the Monarch. However, now that more and more Monarchs are being hand reared in large concentrations and then released to the wild, the parasite is wreaking havoc on the fragile monarch population. Ok – here is the jist of it: OE is a protozoan parasite which begins its life cycle as an inactive spore which needs to be eaten by the caterpillar larvae. Once eaten, the spore begins to multiply and then when the caterpillar reaches the pupal stage (chrysalis) these spores are on that butterflies’ scales when it emerges. The insidious cycle continues when the spores are transferred by the adult when laying eggs or feeding on milkweed, where the spores will be consumed by new caterpillars. EEK! But what makes the tropical milkweed so nefarious is because it continues to grow in warm areas, numerous lifecycles of butterflies will feed on the same plant—the older the plant, the more time OE has had to buildup populations. So what is so bad about the Monarch’s having this alien being growing inside of them? well, just like many diseases, a small dose will not have a major effect, however in larger doses, the caterpillar may not have the strength to pupate, or not be able to properly emerge, or even those that ‘make it out alive’ may be so weakened that they do not have the strength to make the journey to Mexico. These are a few of the Chrysalis I harvested from the Ripley Garden, November 2. Most are showing signs of OE infection. Alfonso recommended that I collect and destroy these so that the OE spores would not continue to build up in the garden. It is heartbreaking isn’t it? Mother Nature is a fragile thing, and we gardeners can unknowingly wreak havoc on what we hold so dear. So, going forward, my lesson learned is to continue to grow as many milkweeds as possible – but only those that know to die back in the fall so that I am not tempting anyone to stick around for the winter nor harbor nasty alien beings! Yes, Leopold got it right. There is only one biota. He coined this phrase in reference to the formation of what we call prairie. But I think we can extrapolate the phrase to global significance. Think about it. All life is connected. All life is dependent on things like carbon, water, sunlight, nutrients, rocks, soil, temperature, oxygen , etc. One life form performs functions in the ecosystem needed by other living organisms in the system. Consider the simple connections like plants capturing the energy of sunlight in photosynthesis and then making that energy available to animals and humans for life support, while at the same time these same plants are releasing the oxygen needed by these same animals and humans. And the animals in turn release the carbon dioxide needed by the plants. That is a very intimate life connection – so do you see what I mean when I say there is only one biota? What about the bacteria and fungi in the soil that decompose complicated molecular compounds and release nutrients to plants for life support or those very important bacteria that cooperate with leguminous plant roots to take the nutrient we call nitrogen right out of the air we all breathe? Very few organisms on earth could survive very long at all if the sun did not appear each day to supply the energy we all need – all of us, one biota, depend on the sun- except for some microbes that can metabolize certain molecular compounds and do not need the sun, but they still need the air and the elements released into that air by plants and animals and yes, rocks. They need the elements in the rocks, as we all do, to sustain life. Yes, rocks are needed to sustain life as we know it. Again, it is all one biota. So I beg you please leave the box you live in and get outside onto a prairie or into a woodland or into a mountain meadow or a wetland or onto the ocean and look around and feel the life there – observe the plants, see the insects and birds, imagine the bacteria and fungi, look for signs of animals, breathe in deeply the air, absorb the warmth of the sun on your skin – melt a little inside your heart – and then listen, be very, very quiet, stop thinking, set aside any thoughts about decisions needing to be made or work needing to get done, and listen, listen, listen. As you listen continue to observe all the detail around you, see the life, feel the life pulsing in the organisms around you. Do not be afraid to touch it, even lay down in it and talk to it. And then you will begin to experience the meaning of Leopold’s phrase…” one biota”. And then hopefully you will more likely concern yourself with the practices of conservation and preservation. Do this not only to protect the natural beauty of the life around you, but to be a person of ultimate integrity, a person who values the preservation of your fellow beings in this thing I refer to as one biota over economic gain or personal ego. So often humans have been driven by these latter two selfish motivations and such pursuits have led not only to environmental degradations of unimaginable proportions, such as the extinction of not only species, but entire ecosystems. It has also led to destructive wars and genocides around the planet, and of course extreme poverty and its associated diseases and hunger. And then too, maybe all people of all races and cultures can begin to see that even among humans there is only one biota. We all on this planet are all engaged in this thing called life as one biota, we are all connected, our commonalities are by far stronger than our differences… and if we truly desire to be humans of dignity and integrity we will join with people of all the world to build lives of value and worth, freedom, quality, peace and joy. I hope it will be helpful to this process to remind ourselves constantly that on this planet there is only ONE BIOTA. In this context, it becomes painfully clear why we cannot simply let what happened to a people who called themselves the Kansa be forgotten. 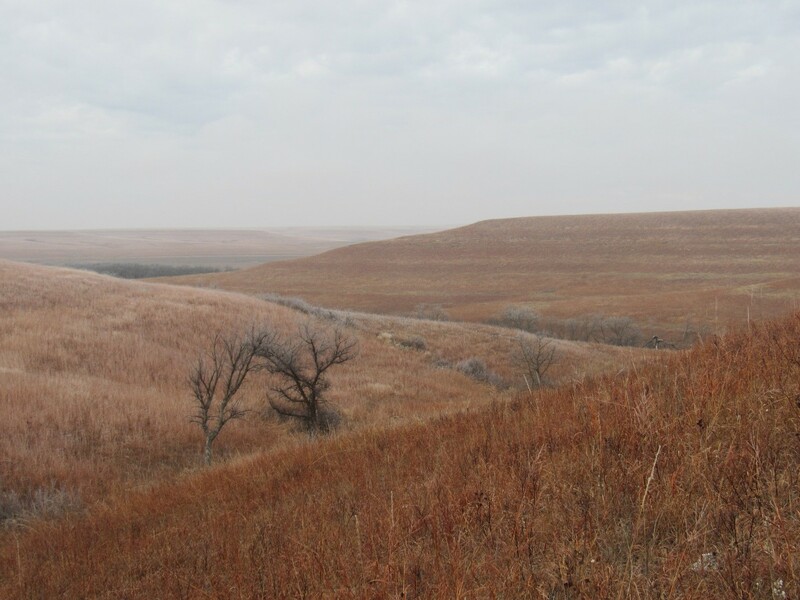 They were, people, part of the one biota, living on the majestic tallgrass prairie of a land now named for them… Kansas. In a short time, from 1825 to 1873 they were almost completely wiped off the planet by the pursuit of other people for land and economic gain. And with them went many of the animals and the plants of an ecosystem thousands of years in the making. The prairie flora and fauna mostly disappeared, only to be found in remnants. The Kansa ended up living in a land that came to be called Oklahoma. As members of the one biota let us live in a way such biotic catastrophes never happen again. Thoughts of Glenn Thomas Fell, Emporia, Kansas. Glenn Fell, the author of the above essay and photographer of these photos is a Facebook friend of mine. 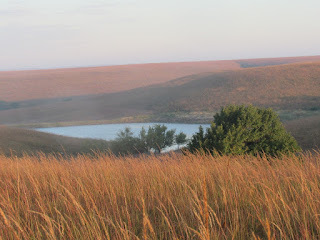 I have followed his photos and informational notes on the tallgrass prairie in the Flint Hills of Eastern Kansas with great interest. 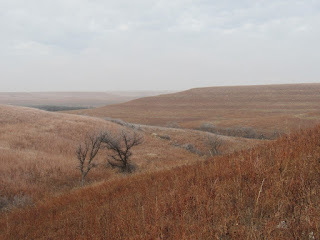 I have always been fascinated by this biome since that I was a little kid, wandering the tallgrass prairies owned or rented by my father, just a little to the east of the Flint Hills in the Osage Cuestas of Eastern Kansas. Recently, Glenn posted his essay, 'One Biota' on his Facebook page. Even though his example used is the tallgrass prairie of Eastern Kansas, there is a universal lesson to be learned from this example that can be applied to any place in the world, including Maryland. Glenn's message is an important one that I felt needs to be shared so that people have a better understanding of how people's decisions have affected our natural world and hopefully will give us pause before we make decisions that will be destructive to our natural world, which is the world that we all live in. Although Aldo Leopold's book 'A Sand County Almanac' was written and published many years ago, it has many important observations and lessons about our natural world in it. It was assigned as required reading in one of my classes at Kansas State University many years ago. I was not thrilled when I started reading it; however, I did get hooked as I got deeper into the book and started to understand the universal message that does not change with time. I definitely recommend this book as one to add to your reading list. Glenn Fell received his PhD from Penn State in Agronomy in 1984. Immediately following that he taught at an agricultural college in South Africa for 3 years. He also taught at Mid America Nazarene University in Olathe, Kansas for 14 years. Glenn grew up in Massachusetts. He is the regional leader for the Kansas Native Plant Society for the region encompassing the Flint Hills. Summers in Maryland have always been hot, but my 2016 summer experience took the heat to a new level. This year, I interned on campus at the UMD Arboretum and Botanical Gardens with the hard workers of Facilities Management. I have gained a deeper appreciation and respect for the work that they do to keep our campus beautiful. Some tasks that I helped with included planting, clearing, watering, installing fences and weeding. Pulling weeds was the most performed task, but as my supervisor told me, "it is a necessary evil". It may be difficult at times, but it is satisfying to see the results of your labor. Personally, the biggest difference I made this summer was on the H. Edward Reiley Rhododendron and Azalea Garden. It was the first space I was introduced to, and it was covered in weeds. 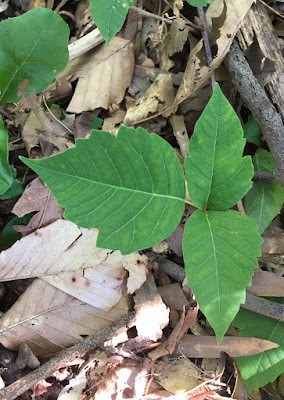 The paths were impassable and the shrubs were taken over with vines such as poison ivy (Toxidendron radicans), which popped up beneath the benches. This woodland garden is densely shaded, so even on a hot and humid day the space could provide some relief. Pulling weeds became meditative. After spending most of my summer in the garden, I feel attached to it and the work I have done. It was important not to feel overwhelmed by the task. With the help of an additional intern, and by taking the garden one section at a time, we were able to clear it in about a month! Repeatedly seeing and interacting with certain plants allowed me to learn about them and how to identify them. For example, blackberries, wineberries, and poison ivy all have similar leaves to the untrained eye. Subtle differences such as thorns, hairs, leaf margins, and size make identification easier. After we cleared the weeds it was time to give the garden a fresh look. One morning we were faced with a four foot pile of Leyland cypress (Cupressus x leylandii) wood chips. Winds lifted the fragrance of the wood through the garden as we spent the next few weeks dumping and spreading wheelbarrows of chips. I truly enjoyed working in this garden. Returning it to an enjoyable and usable space makes me appreciate the privileges I have on this campus. I will certainly return to the garden during the school year. Click on the below link to a campus map, click on the address search tab and then enter the campus locations to find out where buildings are located. As of September 10, 2015, Google does not have the correct locations, while this map does. http://maps.umd.edu/addressing/ There is a second, more complex, interactive campus map that has much more information on it such as parking locations, public transportation etc. when you use the red 'layers' tab. http://maps.umd.edu/map/ The red 'directions' tab will allow you to get directions from one building to another. Our gardens are free and open to the public. There are some parking lots (read the signs for that parking lot carefully) that are free to park in after 4 pm and before 7 am and on weekends, except on game days and during other special events. There is public parking in four large parking garages at the rate of $3 per hour with a daily maximum of $15. On weekends in the garages, the rate is $3 per hour with a daily maximum rate of $5 per hour. There is a small amount of additional pay parking along some streets. 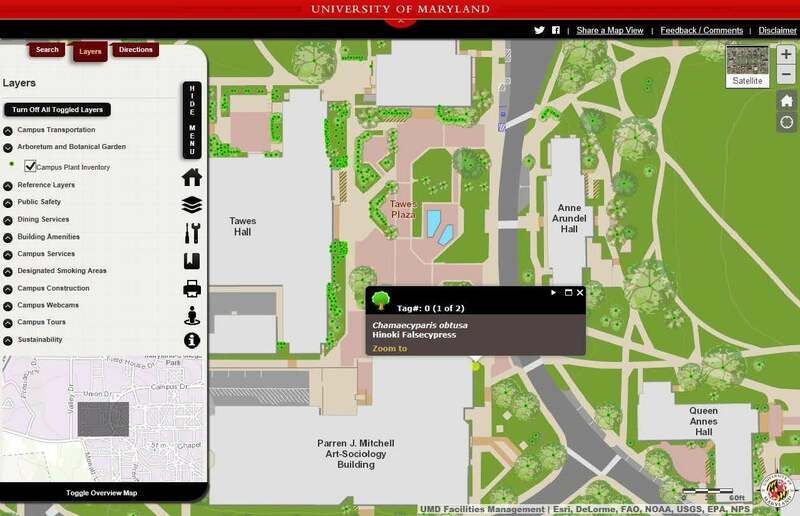 Navigation around campus is much easier with these interactive campus maps: http://maps.umd.edu/map/. You can look up parking locations and building locations using this map. Use the search tab to bring up the page to search for campus building names, locations and addresses. The University of Maryland, the state’s flagship campus, is located in the Baltimore-Washington corridor. The American Association of Public Gardens, by designating the university as an arboretum and botanical garden in 2008, recognized former President C.D. Mote, Jr.’s commitment to becoming a green campus. Maryland is also the first university in the state to be honored as a Tree Campus USA by the Arbor Day Foundation. The Arboretum and Botanical Garden consists of our entire 1,250 acre College Park, Maryland campus. 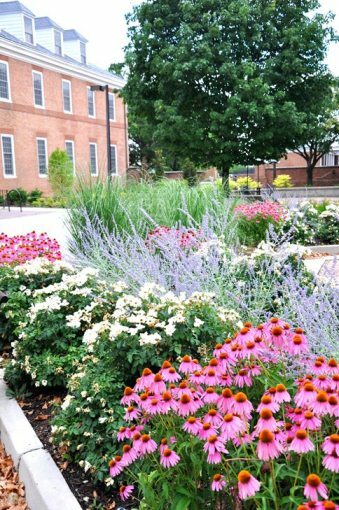 The Campus collection of over 8,000 trees, garden plantings and nearly 400 acres of undeveloped urban forest is a beautiful reminder of Maryland’s history and a harbinger of Maryland’s future. 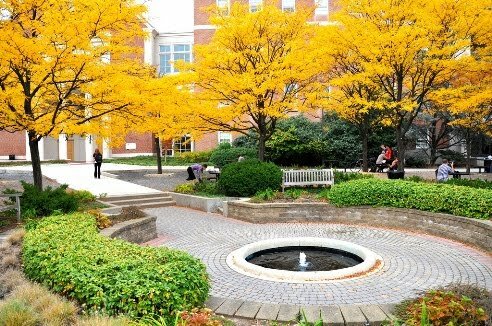 The university looks at the campus’ green space as a major resource for its educational, research and service missions. You can look up the identity of many trees and a few other plant materials using this interactive campus map: http://maps.umd.edu/map/. Click on proceed to map. Then click on the dark red 'layers' tab in the upper left corner. Next select 'Arboretum and Botanical Garden' and then click on the box in front of 'campus plant inventory.' Wait for green dots to slowly fill up the map, then click on the green dots on the campus map to identify the plant materials. Our plant inventory or plant collections database can also be considered a plant database, plant search, plant locator, plant finder, plant collection database, living collections management system, plant records system or plant mapping system for campus plantings. Kim's Knee High Purple Coneflower, Russian Sage, White Out Rose and Dwarf Pampas Grass are featured in this planting in 2010.